How to use the Slider (Revolution) module? Slider Revolution is an innovative, responsive WordPress Slider Plugin that displays your content the beautiful way. The Live Composer page builder provide a custom module for this popular slider plugin. Once you created the slider, drop in your page a "Slider (Revolution) element. Use the "Revolution Slider" feature and select your slider. If needed, save the changes and reload the page. 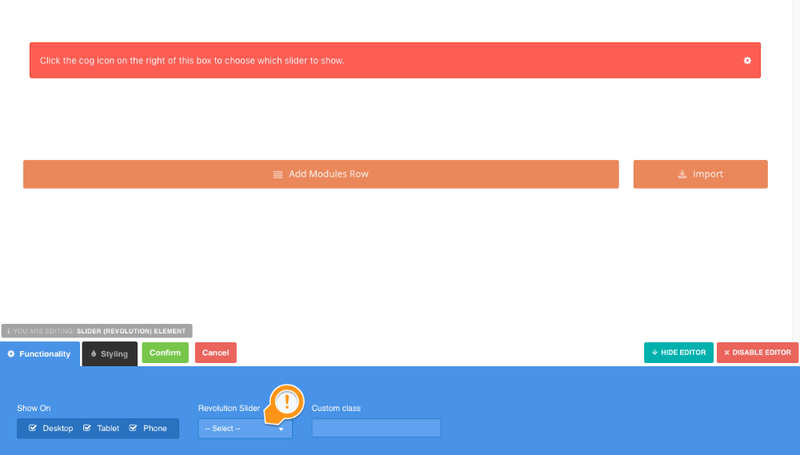 The Slider (Revolution) module is dedicated to the Revolution Slider plugin. It can't be used for another slideshow plugin. You can use any other slideshow plugin what fit your needs and displays the data using shortcodes. The shortcodes need to be paste in an "HTML module".